I started with American Apparel Hassid on all of my nails except for my ring finger, where I used American Apparel Dance. 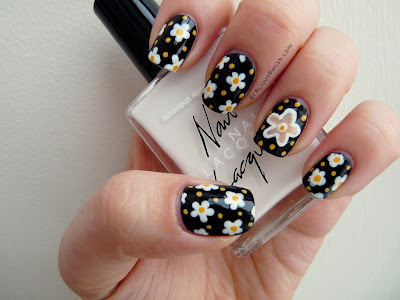 I used small dotting tools to make the flowers and dots using American Apparel T-Shirt and American Apparel Manila. 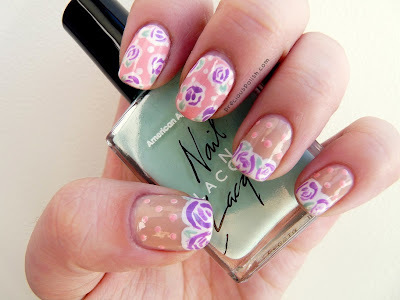 For the accent nail I outlined the flower using a black striping polish and filled in the rest with American Apparel Hassid. Then I took a white striping polish to re-outline the flower again. Today I have a pretty quintessential Valentine's Day manicure featuring lots of glitter and big hearts in a pink and purple colour scheme. I was home for the weekend when I did this one so I didn't have my usual polishes. I found this untried glitter, tokidoki Stellina, and knew that I wanted to use it. I pulled up another untried, China Glaze Creative Fantasy, which ended up being a disappointment. It had a promising jelly finish but was too uneven for me. Luckily, it makes a fantastic base for Stellina! Finally I paired the combo with a lovely pink creme that matched the scattered pink glitter in Stellina. On my thumb, index, and little fingers I started with OPI Kiss Me On My Tulips. For the other two nails I used China Glaze Creative Fantasy with tokidoki Stellina layered on top. I free-handed the hearts and did the gradients with the polish brushes. 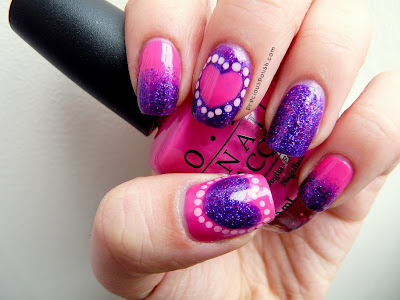 I outlined the hearts with a dotting tool and OPI Pink Friday. So it looks like I'm starting the Valentine's Day festivities early this year. I want to get a head start because February will be a busy month and the fourteenth will surely come by too quickly. 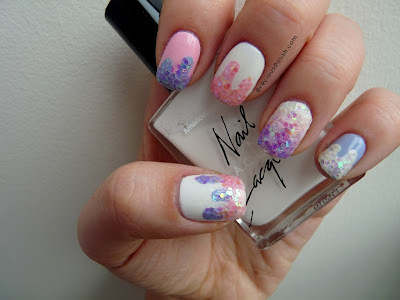 I'm hoping to do several different Valentine's Day looks for you- hopefully you find something you like :) This manicure is a really simple one to do- perfect for a sweet, last minute look. I've had this wheel of half pearls sitting around for ages so I decided to use the smallest size to spruce these up. To start I used American Apparel American Denim. 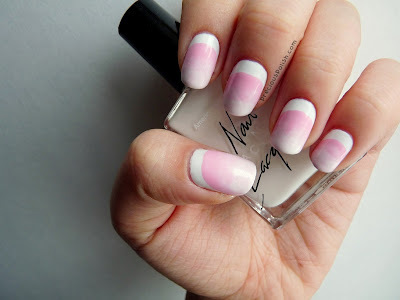 I took a white striping polish to make vertical stripes down each nail. 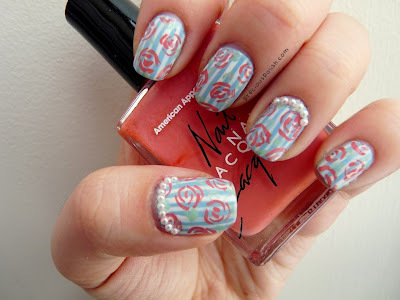 With a striping brush I painted on the roses using American Apparel Rose Bowl and American Apparel Office for the leaves. 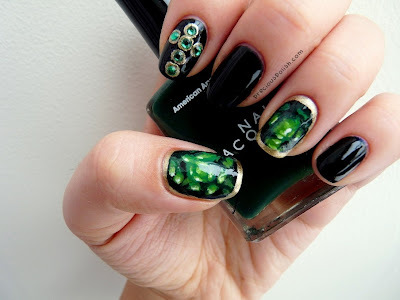 I used topcoat and tweezers to apply the half pearls along my cuticle. I realized that there have been a lot of nail trends in the past year that I totally missed the boat on. There are so many designs that I have to try so here's yet another popular pattern that's new to me: ikat print (pronounced ee-kat, not i-kat, apparently). This is actually the easiest design ever. I gave myself a good hour and a half before dinner to do these but they took only 20 minutes, tops. To start I used American Apparel California Trooper. 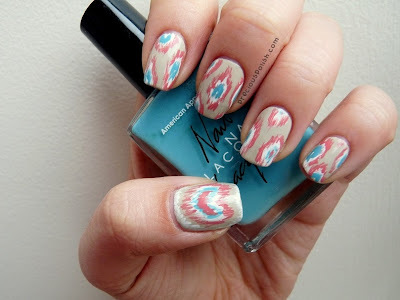 I used a white striping polish to paint the ikat print. I removed most of the excess polish and used quick, short, light strokes. Then I used a striping polish and American Apparel The Valley and American Apparel Rose Bowl to paint the rest of the ikat print using the same technique. I started with American Apparel California Trooper on all of my nails. Using the polish brush from American Apparel The Valley I painted a little less than half of the nail near the cuticle. 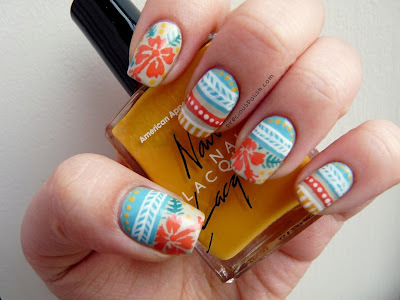 For the tribal print I added stripes of colour with the polish brushes from American Apparel Sunset Blvd and American Apparel Manila. 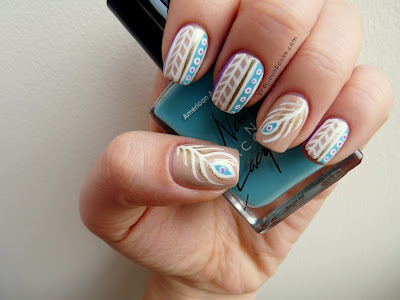 I used a white striping polish for the designs and a dotting tool. For the hibiscus flowers I used a striping brush and American Apparel Sunset Blvd with American Apparel Malibu Green for the leaves. Hi there! I have a lot to say about today's manicure so I'll save you the life ramblings and jump right in! I had two things in mind when I got started on today's nails. First, I knew that I wanted to properly try out American Apparel American Denim. I had used it in the watercolour manicure Underwater Treasure last week but that wasn't the full-manicure treatment that it deserved ;) I was pleasantly surprised by American Denim because it was completely opaque in just one dreamy coat (cue swooning). Anyway, criteria number two was that I wanted to try out a new pattern. After a lot of hemming and hawing I decided on a faded houndstooth print. But see, the thing about houndstooth is that the pattern absolutely boggles my mind, so much so that I was unsuccessful with Chelsea's Get Nailed's comprehensive video tutorial. Instead, I had to work very slowly, one 'square' at a time. It was a painstaking process but the end result is satisfactory. It's definitely something that I'll have to work on! To start I used American Apparel American Denim. 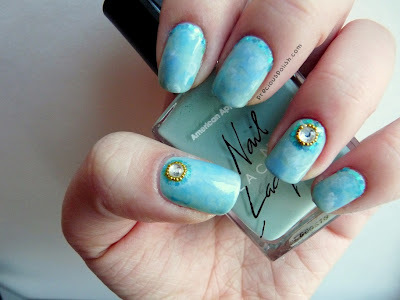 I then sponged on American Apparel T-Shirt onto the tips of the accent nails. With a white striping polish I freehanded the houndstooth. Hello! Winter break went by so quickly for me. Later today I'll be moving back to residence to start my second term of university. I have mixed feelings about everything and I am simultaneously: sad to be leaving home, excited to see friends, horrified to start school, really hungry, etc :P One of my main concerns is being better about keeping up with blogging though. Hopefully I can manage my time better to post consistently! 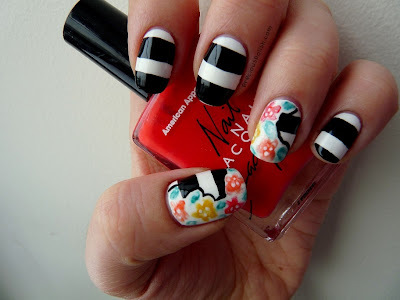 Ruffian manicures used to be my favourite thing ever. Way back in the day I probably loved them even more than tribal prints. I even have a ruffian manicure in my drafts that I never posted because there were too many recent ones on my blog :P But today I brought it back and I am reminded as to why I love them so much. They're clean and simple, yet eye-catching. I spruced this pink and white one up with a white gradient. I started with a base of American Apparel T-Shirt. Then I painted on the ruffian with American Apparel Coney Island. Once that was dry I sponged on American Apparel T-Shirt on the tips. I started with American Apparel Office. I used the watercolour technique to apply American Apparel American Denim, American Apparel The Valley, and American Apparel T-Shirt on top. I used topcoat to adhere the large rhinestones, and outlined them with gold micro beads, followed by iridescent blue hex glitter. I also added a row of the glitter around the cuticle of the rest of the nails.